Thank you for notifying us that you have posted a copy of bell hooks’ “Postmodern Blackness” to your website. Unfortunately, by doing so you have violated copyright law. According to PMC’s contract with its publisher, the author retains copyright of any work published in PMC, although PMC and Johns Hopkins University Press must be credited whenever an article is re-published. A third party can’t reprint or repost, without permissions from both author and, at this point, JHUP. For an example of how such a link would work, please see . If you choose to retain the currrent format for the re-posted article, you must secure permissions from both Professor hooks and Johns Hopkins University Press. I believe that you can contact Professor hooks via Oberlin College; the phone number for the English Department is (440)775-8570. Please keep PMC updated on what course of action you choose to pursue. First, let me congratulate University of Pennsylvania African Studies Center for successfully (evidently) not violating copyright law. What stands out from this adventure is that bell hooks herself told me to publish her work anyway—but I did not. I decided to learn from this experience instead. I learned that when young, Black academics set out on a religious quest to be recognized by the ‘proper authorities’ they will know why the caged bird sings. Fortunately bell hooks came out from the gilded academic cage from time to time. 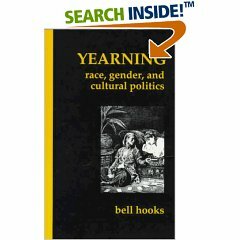 We have one of those times in the form of streaming audio, “bell hooks: Connecting Self and Community,” here at kintespace.com. Previous Previous post: Why no permalinks?